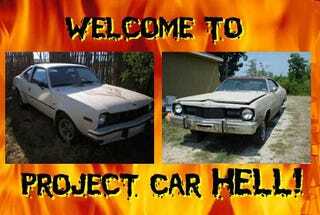 Project Car Hell, Malaise Special Editions: Hang 10 Dart or Levi's Edition AMX? Welcome to Project Car Hell, where you choose your eternity by selecting the project that's the coolest... and the most hellish! Italy held on to its PCH Superpower crown in our last Choose Your Eternity poll, with the Alfa Romeo Duetto taking a 53-47 victory over the British contestant. After admiring the lovely surfboard-friendly Hang Ten Dodge Dart in yesterday's Moment of Zen, we had no choice today but to pit a basket case totally restorable Hang Ten against an equally awesome Malaise Era Special Edition AMC, complete with tape stripes and low-performance engine. The Hang 10 Dodge Dart didn't come with a surfboard, but it did feature a rear seat that folded down, enabling Slant-Six-powered hodaddies to avoid that unsightly board-out-the-window look. You got cool Hang 10 graphics and a bunch of other special stuff to make you forget that the base Slant Six only made 95 horsepower and the 318 V8 just 145. We all want a Hang 10, of course, but where can you find one these days? Hawaii? Huntington Beach? No need to go anywhere near the Pacific, dudes and dudettes, because this 1975 Hang 10 Edition Dodge Dart (go here if the ad disappears) lives in South Carolina! We don't know what kind of engine this one has (in fact, judging by the height of the front end, we're not sure it even has an engine), but every junkyard in the hemisphere has at least one 360 waiting for you. As for the rest of the car… well, the seller doesn't waste any keystrokes on excess description: "Needs normal restoration, solid car." Does "normal restoration" mean "total replacement of floor pans, quarter panels, trunk floor, upholstery, wiring harness, brakes, and fuel system," or will this car end up being a difficult project? Only one way to find out! At least you can get repro decals for it. Darts are great, but all the surfing-themed decals in the world can't make one a rare car. If you're thinking about a special-edition Malaisemobile that you don't see every day, you need to look at some of the stuff they built in Kenosha. Say, f'rexample, this 1977 Levi's Edition AMC Hornet AMX (go here if the ad disappears), priced at just $3,200. It's in (theoretically) rust-free New Mexico. The seller claims "This car is said to have belonged to the Levi Strauss family," and that it's either one of 2,500 or one of 100 made. It "runs and drives good," but needs a U-joint (or something more expensive that makes a sound like a defective U-joint) and a bunch of body work. The Hornet hood and trunk graphics are psilocybic, and you can even get replacements if necessary. How hard could it be?